කාලගුණ විද්‍යා දෙපාර්තමේන්තුවේ, ස්වභාවික විපත් පිළිබඳ පූර්ව අනතුරු ඇඟවීමේ මධ්‍යස්ථානය විසින් 2018 නොවැම්බර් මස 04 වන දින ප.ව. 08.00 නිකුත් කරන ලද විශේෂ නිවේදනයට අනුව දකුණු දිග මධ්‍යම බෙංගාල බොක්ක මුහුදු ප්‍රදේශයේ නොවැම්බර් මස 5 වන දින රාත්‍රියේ අඩු පීඩන තත්ත්වයක් වර්ධනය වන ලකුණු පවතින බව නිවේදනය කර ඇත. මෙම අඩුපීඩන තත්වය බස්නාහිරට බරව වයඹ දෙසට ගමන් කරමින් නිරිත දිග බෙංගාල බොක්ක මුහුදු ප්‍රදේශය සහ දිවයින හරහා මන්නාරම් බොක්ක මුහුදු ප්‍රදේශය දක්වා ගමන් කිරීමේ හැකියාවක් පවතින බව තවදුරටත් නිවේදනනයේ සදහන් කර ඇත.ඒ අනුව කාලගුණ විද්‍යා දෙපාර්තමේන්තුව මගින් මේ සම්බන්ධව නිකුත් කරන ඉදිරි නිවේදන පිලිබඳ අවධානය යොමුකරන ලෙස මහජනතාවගෙන් සහ ධීවර හා නාවුක ප්‍රජාවගෙන් ගෙන් ඉල්ලා සිටිනු ලැබේ. 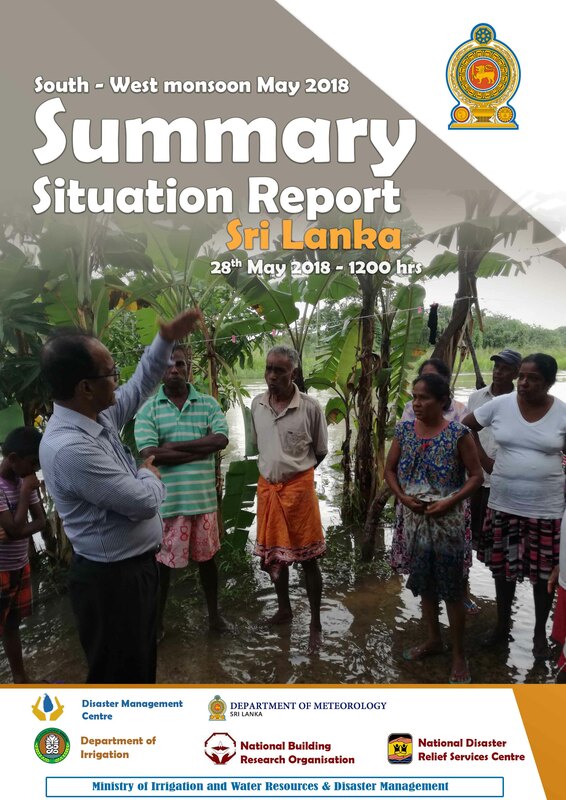 Heavy pre-monsoon rains in Sri Lanka from 20th to 26th May 2018, have killed at least twenty-four people, and more than 170,000 people are affected in 20 District as of today. Water levels of main rivers are currently showing normal levels in many stations. 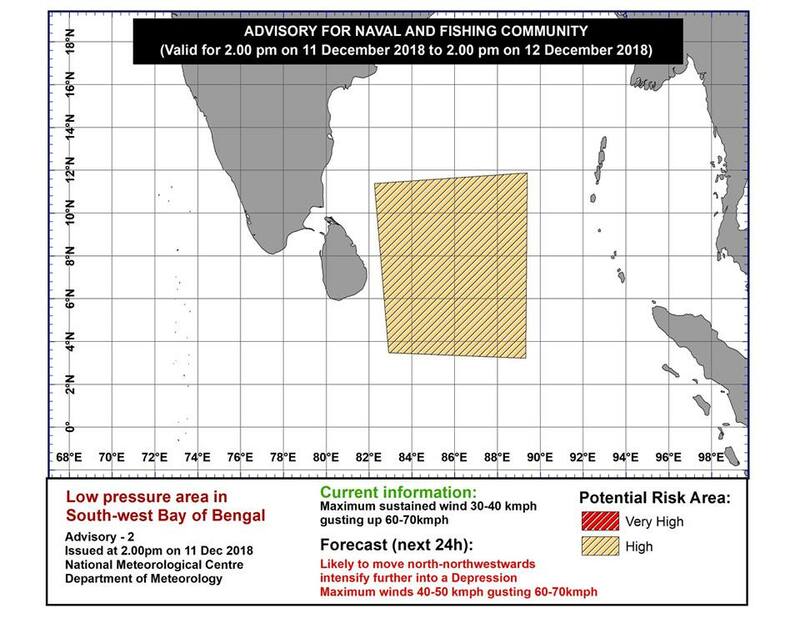 However, one station is at Alert level in Kalu Ganga & Nilwala river falling slowly. All major reservoirs are at normal level however, some of reservoir gates are opened for release of flowing water from other areas to reduce flood threat. NBRO has still given land-slide threat to Ratnapura, Kalutara, Kegalle, Nuwara-Eliya, due to potential earth slips and cut failures. 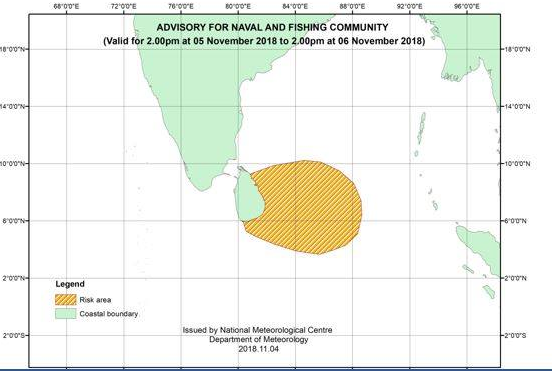 South-west monsoon has now established over Sri Lanka however air circulation is in the vicinity of south-west of Indian sea area and wind speed can be increased time to time. 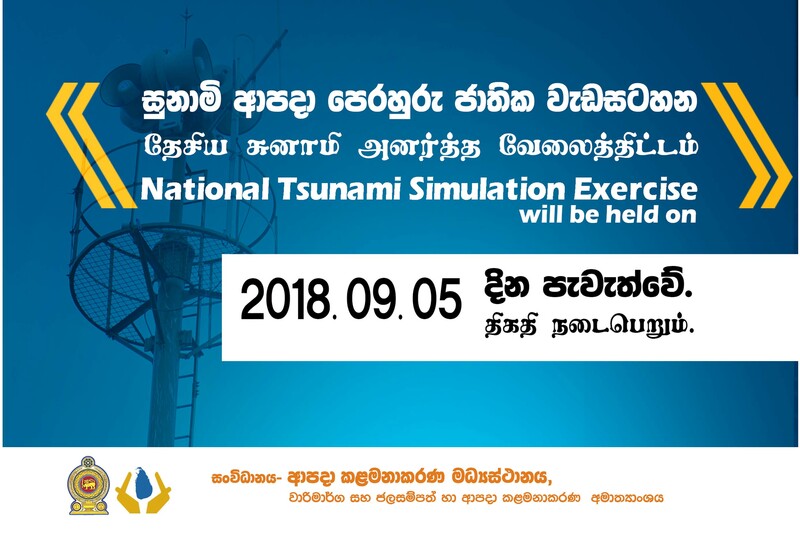 National Tsunami Simulation Exercise scheduled on 05th of September 2018. This Regional and National Tsunami Simulation Exercise is scheduled on 5th of September 2018 with the participation of seven Indian Ocean Rim Countries. 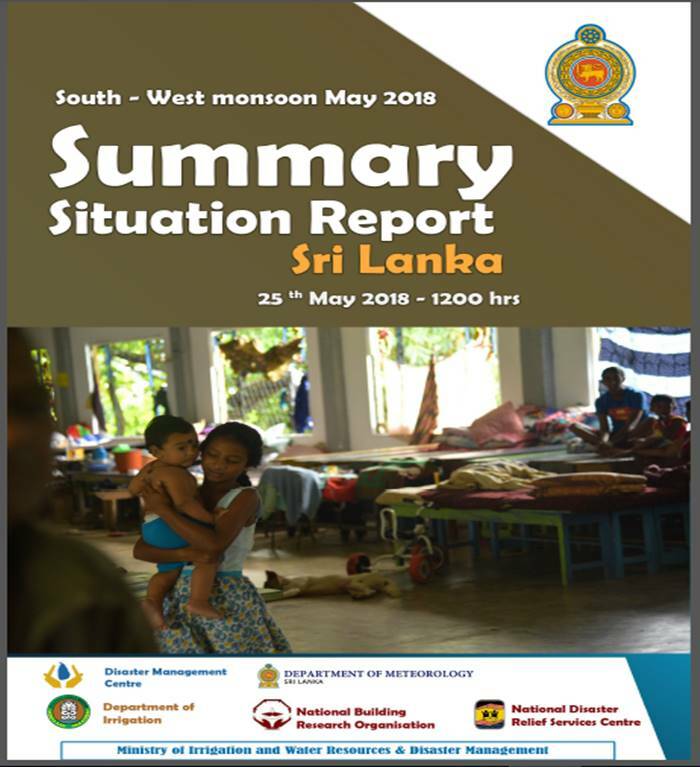 In Sri Lanka, the activation and coordination of this simulation exercise from National to local level is entrusted to Disaster Management Center (DMC). The overarching objective of this regional and national scale exercise is to measure the physical as well as the human resource capacity and response times of the various stakeholders involved to address such a rare but potentially destructive tsunami event.